Will Burns & Hannah Peel - Chalk Hill Blue. Vinyl LP, CD. Bleep. 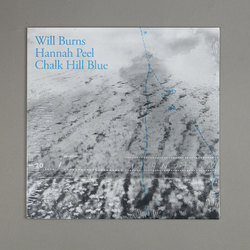 ‘Chalk Hill Blue’ is the first album by poet Will Burns and musician and composer Hannah Peel: a record of electronic ruralism channelling lives threaded through the chalk landscapes of Southern England. Existing and reacting off each word and sounds in the studio together; with the words of poet Will Burns, the analogue electronic compositions of Hannah Peel and the overarching eye of producer Erland Cooper, all tracks were produced and recorded in their entirety within 12 hours. The spoken words and sound worlds often seem to emerge from subliminal processes of call and answer; a fertile blurring of collective inspiration and intention circling this abstracted chalk landscape. LP contains insert and digital download code.